The following article will explain my reasons for being a member of the latenightstampers group. It is also extremely fabulous advice for anyone. Enjoy. If you put yourself in a positive frame of mind, you can accomplish anything. If you can clearly see your goal, see that it’s within your grasp, there’s nothing stopping you. That’s why surrounding yourself with positive images and visual reminders can be just what the doctor ordered. You may already have an inner voice telling you that you can do it, that you can reach your goal. But sometimes, that inner voice could be distracted, a little discouraged or even intimidated. Sometimes, it lacks conviction. Sometimes, you need an external voice telling you the same thing, reinforcing your confidence and determination. Think about what might happen without that positive reinforcement. Suppose you had a parrot sitting on your shoulder, cackling in your ear all day long that your efforts are useless, that you will never reach your goal. Or suppose that every day, you were faced with a taunting picture of you looking your god-awful, embarrassing worst. Sounds pretty discouraging, doesn’t it? Surrounding yourself with negativity will drain the energy, life and hope right out of you like a leech. Seems pretty obvious, but too often, we allow these negative messages to seep through. Thankfully, the opposite is just as true. One of the quickest ways to boost your spirits and keep motivation high is to keep a positive picture of your goal close by. A picture or other visual of your ultimate goal is a huge motivator. Having it around all the time is a voice of encouragement whispering in your ear, helping you stay focused on the prize and energized to overcome any obstacle. 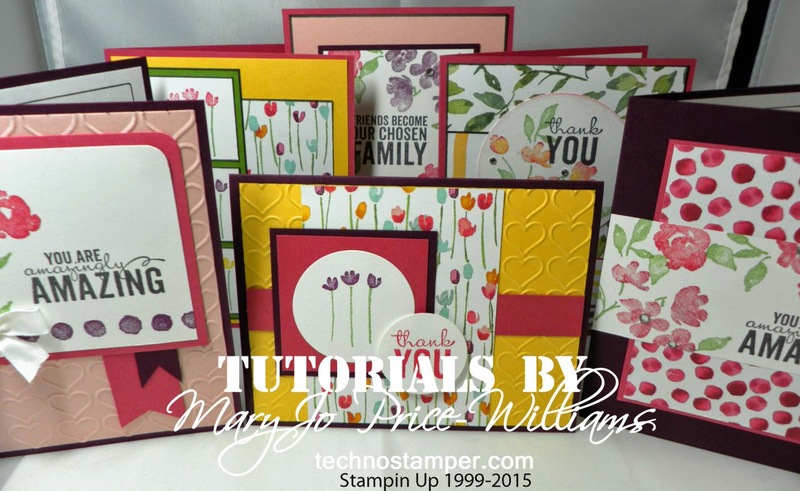 BE A MEMBER OF THE LATENIGHT STAMPERS GROUP! This group has been perfect for me to keep positive. You can use it too! Click on the link below to join. 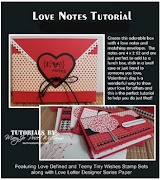 You will not regret it, there are fabulous samples using 100% current Stampin Up! , tons of business ideas, lots of support, and many many new friends to meet. And don't forget about all the great challenges and contests. 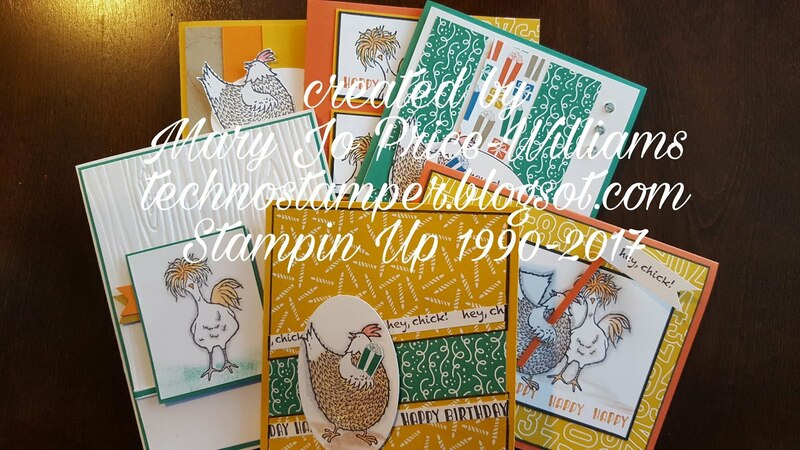 I have won/earned over $500 in Stampin Up supplies since becoming a member, crazy! Use positive images. Find a visual that shows why you want to get healthy in the first place, or what you’ll be doing after you reach your goal. A picture of your family, the new dress you want to wear, or a basketball. Use positive words. Keep notes of encouragement with you or choose a few favorite inspirational words. You can get plenty of these words on the Message Boards. Use positive books and movies. Watch and read positive things that show you what’s possible. Trade your favorites with friends. Find a hero and try to adapt their qualities to your journey. Use positive quotes. Check out our quote library, or keep some inspirational quote books handy. They could give you that lift right when you need it most. Choose one as your personal motto and plaster it everywhere. Use positive music. Let music that makes you feel good become the background theme of your life. With a visual nearby, your goal is right there. It’s clear what you want. It’s clearly within your grasp. You have the power to reach out and just take it. Welcome to 3 Clovers Thursday Challenge #11! I hope that you enjoy this week's challenge! 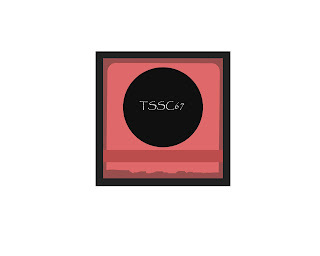 Here is my card using this sketch. It is also part of the You're Hired again series of cards. I think this little girl is just so precious! I love the cats too. This was a cute but simple card. I love the look that the paper piecing added to the hat and apron. Want to play along! We would love to have you join us. Visit Kerry's blog for the details. Thanks for visiting today. See ya later. 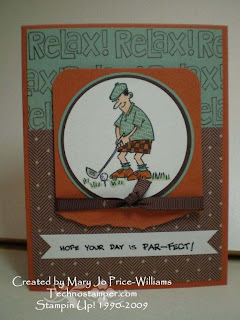 Oh my hubby LOVES to golf and I'd love to win this for him!!! I am already a subscriber. Kimm, contact me and send me your address so I can get this out to you. Congratulations. I am so thrilled with how the tour went! Thanks for all the sweet comments. We will be doing another one in May! Keep checking for more details. This card actually fits three challenges! 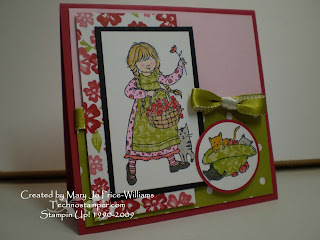 First the color challenge on SCS today--Real Red, Basic Black and Old Olive. 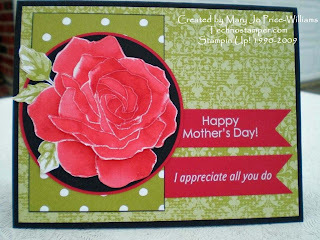 Next is the monthly DT challenge on Latenightstamper--Mother's Day and finally the weekly challenge on Latenightstampers which is to case a card off of our list mom Sherrill Graff's blog. Now that I think of it it actually fits four, it is also 100% current Stampin Up and will be one of my You're hired again series of cards! I will be posting the winner of yesterday's blog candy later today, I need to add numbers to the posts so I can count them all up. I believe there were 223 comments. Maybe you were the lucky one?! Please take a moment to answer my poll question on the top of my side bar. It is about tutorials. Thanks. Thank you for you time. I really have mixed emotions about this and could use your help. Official Tour Times are 8am to Midnight Today Only! Blog candy at the end of this post so be sure to get in on it. 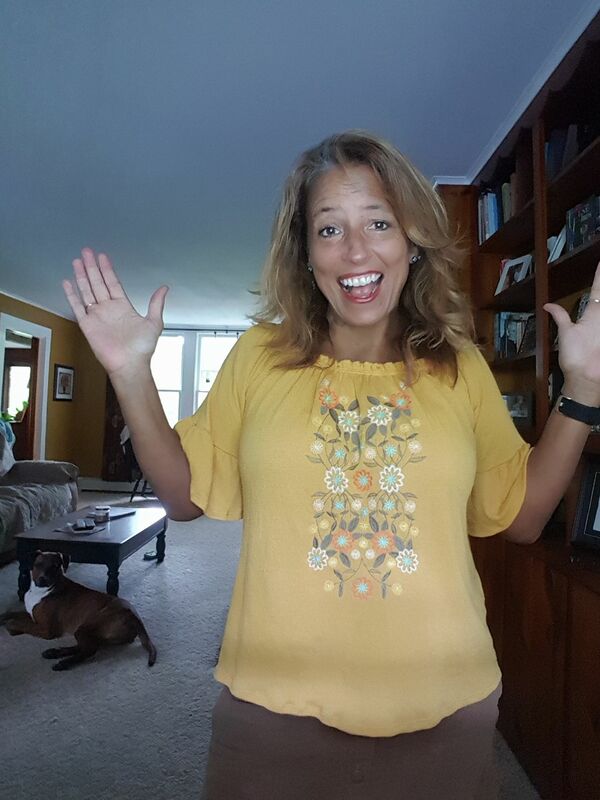 It is here and I am thrilled that you are along for the ride! Glad to see you have your ticket there is so much in store for you today. 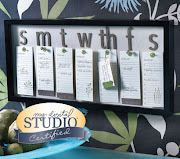 You will follow along through 20 different blogs all showcasing a different product from the Occasion Mini catalog. You will have many different chances along the way to win fun prizes and be incredibly inspired by the wonderful samples. 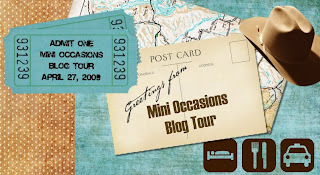 Get your cup of coffee (or drink of preference) and settle in to enjoy the ride with me on the Occasions Mini Tour! 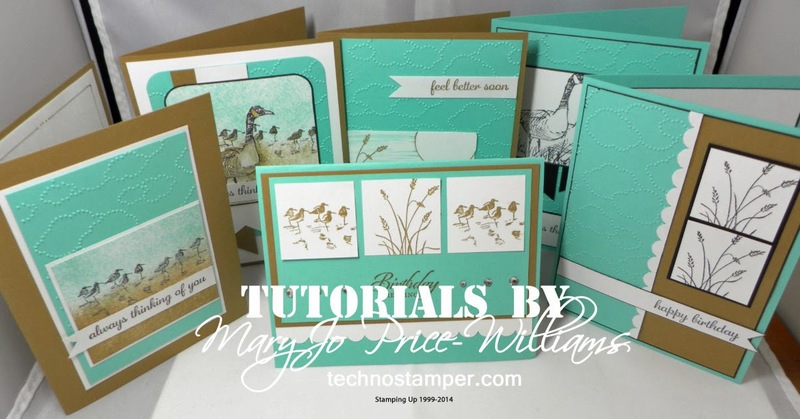 If you are coming from Fun Stampin with Margaret's blog thanks for continuing the tour! If you are starting right here with me that is great too you will just follow the links until you end up right back here . This is stop 17 on tour 2 and I will be featuring and giving away the And Many Mower set. This set is perfect for the manly man in your life. 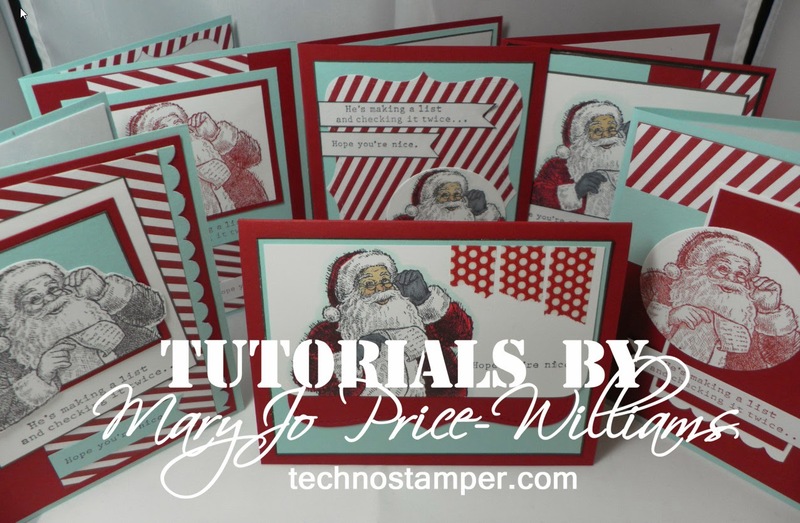 So fun and easy to make masculine cards with. We all have difficulty with masculine cards but this set will make it easy. I promise. You will have a chance to win this set for free too. Read the end of the post for more details. First I would like to share my samples with you. 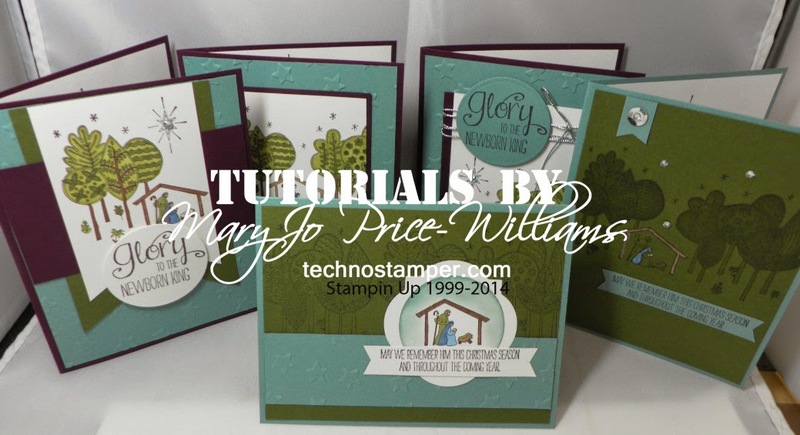 All of my samples will be using 100% current Stampin Up and will be part of my You're Hired Again Series. The first one is using the adorable Golfer Dude. It is also using my Monday Lunchtime Sketch Challenge #67 from earlier today (late last night really). The next sample is using the same colors and dp as the previous one but I am using the adorable checklist stamp from the set. This card is so perfect for my hubby. He is not really into sports or hunting so many of the sets just don't work for him--this is perfect though! Hope you can see the dimension on this one. Too cute. 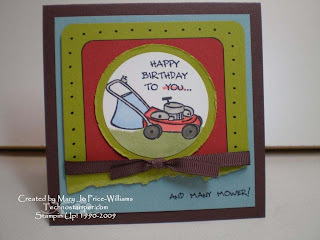 Next up is the cute little lawn mower. I added the words in the oval by hand and part rub on. I had this idea but there were no sentiments that would work so I made my own. The bottom sentiment is from the Really Retro set. 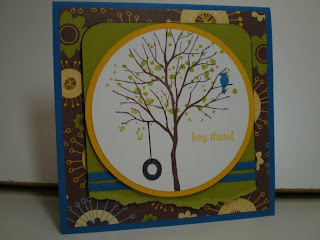 This card is also for this week's Late Night Stamper's Challenge 17. 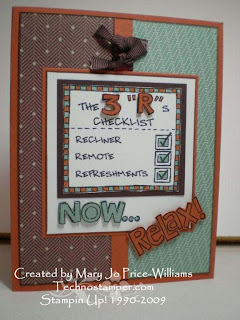 We are to case a card from our wonderful list mom Sherrill Graff's blog. HERE is the card I chose to case. 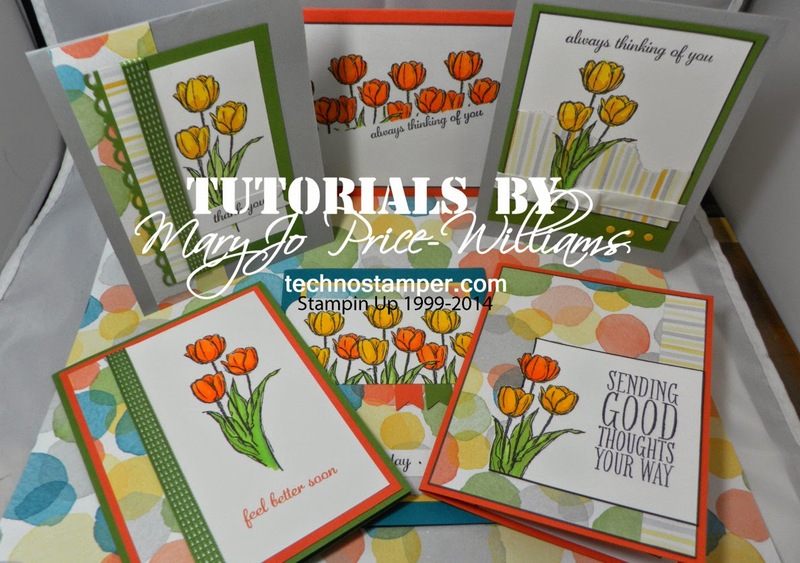 The card was created by Gretchen Barron. I changed the colors and the sentiments treatments. And it is tilted in the other direction. I hope you enjoy my humor on this one. You may have to click on the picture to enlarge it to see the details. And finally another one using my Monday Lunchtime Sketch Challenge #67. This is a simple but fun one. I hope you enjoyed your stop here at my blog. 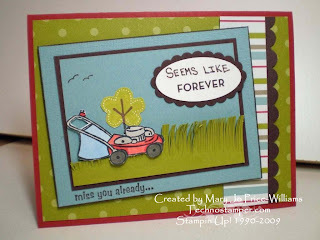 Before you leave be sure to leave a comment on this post to have a chance to win the And Many Mower stamp set. You can get a second change by subscribing to my blog. Just let me know you did in your post and I will add a second chance for you. This is a one day only event therefore I will be closing the chance to win along with the close of the tour. 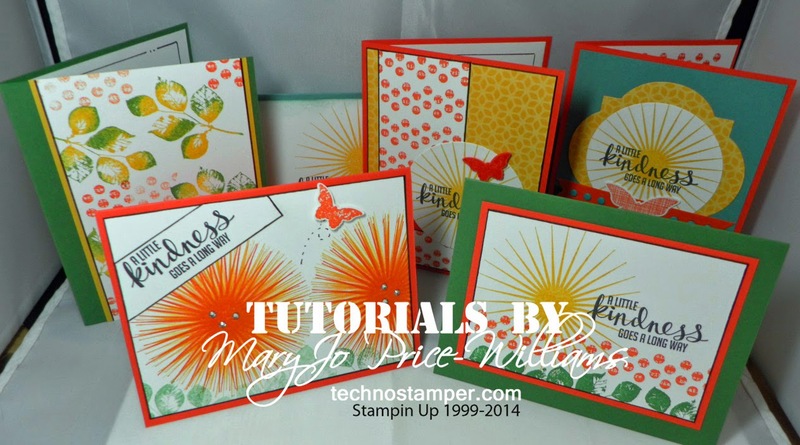 You must get in before 11:59pm EST on Monday April 27th to be eligible to win the free stamp set! I will post the winner on Tuesday. Have fun on the rest of your trip and be sure to come on back now -- ya hear! Look at all the beauties for this sketch #66. They are all fabulous. You can visit each creator's blog by clicking the link above their creation. Thanks to everyone who played this week. Don't go far the new sketch will be up in a few minutes and then the Occasions Mini Blog Tour will also be coming up too stay close. That will be fully functional at 8am.